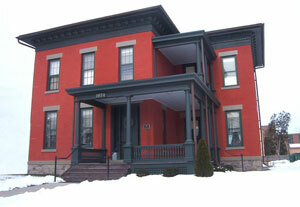 Located at 1074 West Genesee Street, in Syracuse, NY, the Mills House is a significant historic structure. For nearly eighty years, this was the home of Syracuse suffragist and political activist, Harriet May Mills. A NYS historical marker has been placed in front of the building commemorating some of her significant achievements. While Harriet May Mills was the most widely known of her family, the house also served as the Syracuse Home of her parents, prominent social reformers Harriet Ann Mills and Charles DeBerard Mills, and Harriet May Mills' brother, physician William Hough Mills. Dr. Mills maintained his medical practice in the home. The two generations of the Mills family attracted a range of prominent visitors to their home, including the Reverend Samuel J. May, after whom Harriet was given her middle name. The history of the house, and its significance in local, state, and national history, is summarized in the text of the nomination prepared for listing of the house in the National Register of Historic Places. More recently, the building served for many years as the headquarters of the G.B. Stringer hardware company. During its many years as a business establishment, many of the building's historic residential features were lost. By 2001, the building was for sale, threatened with demolition. A July 2000 article in the Syracuse Newspapers by columnist Sean Kirst brought new attention to the potential loss of this important historic site, and helped to set in place a series of actions that promised a bright future for the property. The article featured the story of how the building had avoided destruction, and the efforts of the owners (Jim Taylor and Nancy DeCoursey) to work with the Preservation Association of Central New York (PACNY) in an attempt to find a new use that would preserve the home. A short time later, Syracuse Brick House, Inc. was contacted by PACNY Vice-President Elizabeth L. Crawford to determine the possibility that SBH could provide an appropriate long-term use for the building, and manage a rehabilitation project. Following extensive exploration, the SBH Board of Directors acted in May 2001 to approve a plan for development of an 12-bed halfway house for women in recovery from addiction. Consultation with local neighbors (directly and through the City's Tomorrow's Neighborhoods Today process) has evidenced a high degree of community support for this project. This led to a commitment by the City of Syracuse to finance the purchase and initial stabilization of the project site, and subsequent commitments for state funding (through the assistance of State Senator John DeFrancisco) and a gift from the John Ben Snow Memorial Trust. An application for matching funds was submitted to the Environmental Protection Fund (EPF) with a high level of public and official support. The project was given a high priority in Onondaga County plans. Initial stabilization was carried out by SBH, including bracing of the west wall of the structure. This wall was rebuilt in October 2001, with funds provided by the City of Syracuse. Other renovations began in Spring 2002, starting with reconstruction of the front porches of the house, to approximate their appearance in 1900. This was the most significant visible change in the exterior of the structure, and produced a dramatic impact on the facility, in terms of its beneficial use by residents and its impact on local neighborhood revitalization efforts. The remaining renovations involved reconstruction of the Liberty Street side porch, and the extensive interior remodeling and repairs needed to preserve the building's historic features, and adapted the building for use as a halfway house.